Make a healthy Gazpacho. There is no better warm weather soup than gazpacho because of its light taste and refreshing, cool temperature. Plus the tomato-based, veggie filled soup is a perfect addition to your healthy summer dinners. My favorite gazpacho is from Kruse & Muer, a Detroit based restaurant, and I want to share their delicious recipe with you. Whenever I go back home to visit my family in the summer months I always plan a girls’ lunch at their downtown Rochester location so I can have a big bowl (sans croutons and sour cream). This recipe is adapted from Epicurious.com. It is easy to shop for this soup since you can get the majority of your ingredients from your local farmers market or garden, and if you are Vitamix obsessed (like me!) it can be added to your blender-bender meal rotation. 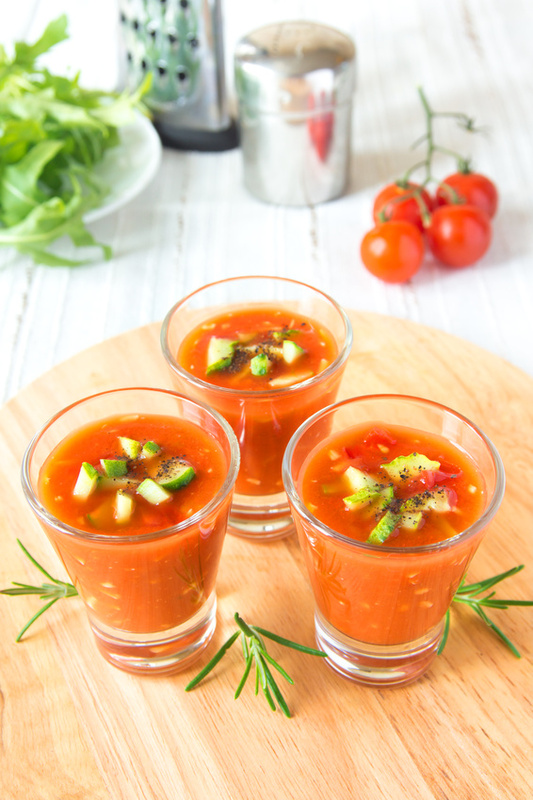 Serving your gazpacho in tiny glasses makes for a tasty, low cal appetizer. The key is to get really good tomatoes! If you can’t find in-season tomatoes, look for smaller, sweeter tomatoes like Campari. I eat gluten free, so I substitute Udi’s Gluten Free Whole Grain Bread for the dense bread the recipe calls for. 3 bell peppers, diced. I’m not a fan of green peppers so I use red, yellow and orange. 1 Vidalia or other sweet onion, diced (tip: the flatter the onion, the sweeter it is! 3 Cucumbers peeled and diced. If you get the English hothouse cucumbers you don’t need to peel. In a large bowl, combine all of the chopped vegetables and set aside. Tear the bread into smaller pieces and put into a blender. Add 1 cup of the chopped vegetable mixture on top of the bread and blend. Add 2 more cups of fresh vegetables into the blender, and then add the vinegar, olive oil, red pepper, lemon juice, and some salt and pepper. Blend until smooth. Add the blended mixture back into the fresh vegetables and stir together. Refrigerate until the mixture has had time to marinade. Test mixture and adjust salt, pepper, oil, vinegar, and lemon juice, to taste. Serve chilled and topped with a dollop of Greek yogurt (I prefer it without the yogurt but it makes for nice presentation).